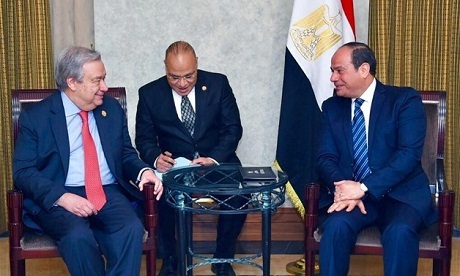 Egyptian President Abdel-Fattah El-Sisi held talks on Wednesday with visiting United Nations Secretary-General Antonio Guterres on international efforts to end crises in the Arab region, MENA reported. The talks focused on efforts to settle the crises in Syria, Libya and Yemen, Egyptian Foreign Minister Sameh Shoukry said at a joint press conference with the UN chief after the meeting. The two sides also discussed efforts to solve the Palestinian issue on the basis of international legitimacy resolutions and the two-state solution, Shoukry said. The FM also lauded efforts exerted by the UN chief that served to further peace and security in Africa. On the upcoming visit by El-Sisi to the the US next week, Shoukry said that El-Sisi will discuss with US President Donald Trump the strategic relations between the two countries in the various fields as well as the situation in the region. El-Sisi will highlight in his meeting with Trump Egypt's stance on the necessity of observing international legitimacy regarding the Golan Heights as part of Syria that can not be seized by Israel. Trump recently recognised Israeli sovereignty over the occupied Syrian Golan Heights. The Egyptian-US talks will also review means of establishing stability in the region and fighting terrorism. During the press conference, Guterres confirmed that Egypt is playing a major role in Libya and that Egypt and the UN are cooperating to prevent a confrontation between warring parties in Libya and achieve stability there. The UN chief said that he will head from Egypt to Libya to hold talks on the situation in the North African country. As for the Palestinian-Israeli conflict, Guterres lauded Egypt's efforts to stop escalation in the Gaza Strip and extend relief assistance to the Palestinian strip. Guterres also noted that Egypt and the UN are working to implement the two-state solution with Jerusalem as a capital for both states. He noted that his talks with President El-Sisi took up the situation in Syria and means of reaching a settlement that is based on United Nations Security Council resolution 2254. The talks also touched on the situation in Yemen. As for efforts to fight terrorism, Guterres added that a summit meeting will be held in Nairobi, Kenya to discuss fighting terrorism in Africa. The UN chief said that no state can settle the problem of terrorism on its own, adding that cooperation between Egypt and the UN on this score is based on three points; peace and security, sustainable development and human rights. On Trump's decision to recognise Israeli sovereignty over the Golan Heights, Guterres said that the UN is of the position that any resolution should respect Syrian sovereignty over its territories, including the Golan. "We affirm Syrian sovereignty over the occupied Golan," he said.